Throughout my (so far shotlived) adult life I have never taken any exercise except sleeping and resting, and I never intended to take any. Well, that was my philosophy… until now. Since hitting a quarter of a century a few months ago I found myself becoming increasingly run-down, lethargic and short of breath at the most simplest of exhaustive movements. So it wasn’t a case of IF I wanted to partake in any physical activity, it was a matter of needing to – that’s if I want to live until a ripe grand old age of course. An attempted light jog had me practically ‘passed out’ in the middle of the road and a hot yoga class conducted in a swealtering, stifling, “can’t breathe” room had me falling over my own limbs before I could even stretch. But… I persevered (just about). So when I was offered the chance to test a state-of-the-art anti gravity treadmill, I have to admit I was slightly dubious. The only thing I had ever heard about this technology was that it was often used by overpayed and underplayed footballers. . . Naturally I was curious. But, as I later discovered, it is also cleverly designed to help people walk, recover from injury and it uses the same technology as NASA. Impressive. After some deliberation I decided to give it a go, why not! If it was good enough for the ‘ballers’, it’s good enough for me. Upon arrival at the Physiquipe Clinic in Didsbury I soon became eager to get started on this unique piece of equipment. Donning some very attractive, specialised shorts along with my gym kit for the session I was ready to get going. But before I began my treadmill test run I was given the low-down on just how beneficial it actually is for certain patients. I soon learned that the machine uses specialized air pressure to help stabilize people. That puts the focus on building leg muscle and takes away a fear of falling. It’s similar to aquatic therapy, but on the machine there’s no resistance from water. That way legs are free to move like they would while walking. And this became clear once machine got up and running. Other than metaphorically, I had physically never experienced the feeling of “walking on air”, but as I differed my body weight and altered the machine I soon learned just what that felt like – and I loved it. Having never set foot on a treadmill for more than eight years I was scared I wouldn’t last five minutes before keeling over. But with the incredible technology, I felt like Mo Farah, running at ease for what could go on for hours. 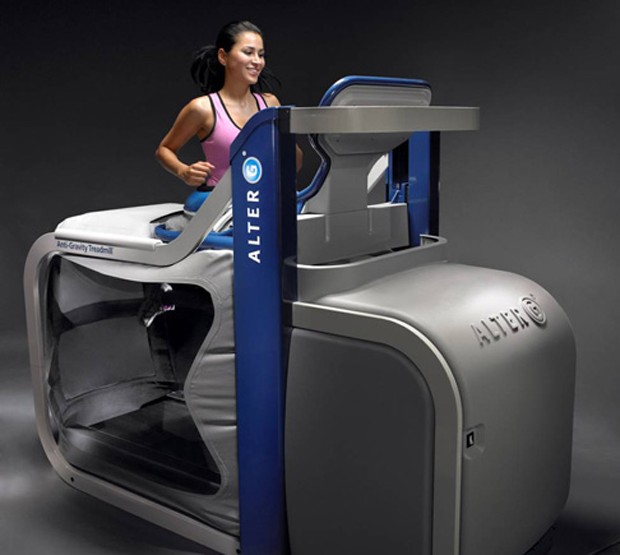 The machine, of course, is altered though to the specific needs of the participant. Whether a top sportsman or an inexperienced patient in rehab, the treadmill allows each individual to work at their own pace and build up the strength to the desired pace. Three different cameras allow therapists’ to monitor imovement from a variety of angles. That also allows them to better monitor the rehabilitation process. It is a machine that makes a believer out of everybody. Once in it, it lifts you up and you can genuinely experience the feeling of being lighter than air, lighter than a feather. It’s breathtaking – literally – but also exhiliarating to know that no matter what abilitiy you are – you can do it. The treadmill, based at Didsbury’s Northern Tennis Club, has been a fixture there for around 18 months and already has received great feedback. As for me, I managed a fantastic half an hour work out and can honestly admit that I never felt better after it. Not only did it give me the benefit that comes with exercise such as being more alert, being able to have a good night’s sleep, stronger muscles and much more. But it also gave me a feeling of achieivement the confidence to start a training programme for myself, now I know I can do it. Prices at the Physiquipe Clinic start from £25 for 30 minutes or £45 for 60 minutes. Packages are also available. For more information contact 0161 300 5591.